Myasthenia gravis is a disease that causes your muscles to tire easily and become weak. This condition affects the nerves that stimulate muscles to contract and the muscles around the eyes are usually being affected firstly. Myasthenia gravis is not an inherited or contagious condition, but it commonly affects women under the age of 40 and men over age 60. Every muscle receives nerve supply from nerves that split into smaller nerve fibers. These nerves spread along the muscle and a tiny gap called neuromuscular junction (NMJ) is found between the end of each nerve fiber and the muscle surface. As the brain sends messages to the muscles through the nerves, a chemical (neurotransmitter) called acetylcholine is released into the NMJ. The acetylcholine molecules attach to the receptors on the muscles and trigger the tightening or contraction of the muscles. In myasthenia gravis, nerve messages are not passed properly from the nerves to the muscles so that the muscles are not properly stimulated, causing them not contract well and easily tired and weak. 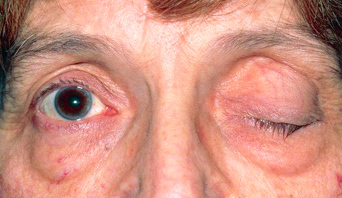 Myasthenia gravis affects voluntary muscles, and the muscles that control eyelid movement, swallowing and facial expression are most frequently affected. The onset of symptoms may be sudden and may not be immediately recognized as myasthenia gravis. The first symptom is often weakness of the eye muscles, which may vary greatly among individuals. Symptoms may range from a localized, limited form (ocular myasthenia) which affects the eye muscles, to a generalized, severe form which affects many muscles, including those involved in breathing. Eye symptoms may manifest as drooping of the eyelids, blurred vision or double vision. Other symptoms of myasthenia gravis include waddling or unstable gait, changes in facial expression, difficulty swallowing, impaired speech, shortness of breath, and weakness of the arms, hands, legs and neck. The immune system produces antibodies that can destroy or block your muscles' receptors for acetylcholine. Fewer receptor sites become available to receive nerve signals, thus resulting in muscle weakness. Antibodies can also block a protein involved in forming the NMJ. When this happens, myasthenia gravis can develop. The thymus gland is a part of the immune system that is found in the upper chest while beneath the breastbone. While this gland is large during infancy, it normally becomes small when you grow up. In some adults with myasthenia gravis, the thymus becomes abnormally large and triggers the production of antibodies that block acetylcholine. Some patients with myasthenia gravis have non-cancerous tumors in the thymus (thymomas). Some people have antibody-negative myasthenia gravis. They do not produce antibodies against acetylcholine or the proteins involved in forming the NMJ, but antibodies against another protein (lipoprotein-related protein 4) may be responsible in the development of myasthenia. Genetic factors that lead to neonatal myasthenia gravis, a condition found in babies whose mothers have myasthenia, and congenital myasthenic syndrome, a rare, hereditary type of myasthenia, have also been found. These medications enhance communication between your nerves and muscles. They do not cure the condition, but can improve muscle contraction and strength. These drugs inhibit immune system function and limit antibody production. Immunosuppressants such as azathioprine (Imuran), cyclosporine (Sandimmune, Neoral) mycophenolate mofetil (CellCept) and tacrolimus (Prograf). These medications alter your immune system. Plasmapheresis. This is a filtering process that routes your blood through a machine to remove antibodies that block nerve signal transmission to your muscle receptors. However, its beneficial effects last only a few weeks, after which the procedure must be repeated. Risks of plasmapheresis include bleeding, lowering of blood pressure, changes in heart rhythm, muscle cramps and allergic reaction to used solutions. Intravenous immunoglobulin. This treatment provides the body with antibodies that alter the immune system response. It has fewer side effects, which include chills, headaches, fluid retention anddizziness. However, it may take several days to start working, and its benefits usually last only for 3-6 weeks. Surgical removal of the thymus gland (thymectomy) may be done as an open procedure that involves splitting the breast bone (sternum) or through a minimally invasive surgery using smaller incisions. A minimally invasive procedure may be video-assisted or robot-assisted.